Starting off a short series of images from Llandudno’s Great Orme Tramway today as we continue Picture in Time. The first image featured shows no. 5 – one of the lower section trams ever since the line opened – as it descends on a reserved section of track on Ty-Gwyn Road. By this time the tram had received the more ornate version of the livery including full lining with the overhead for communication still in place too. The date of this image is 29th July 1996. 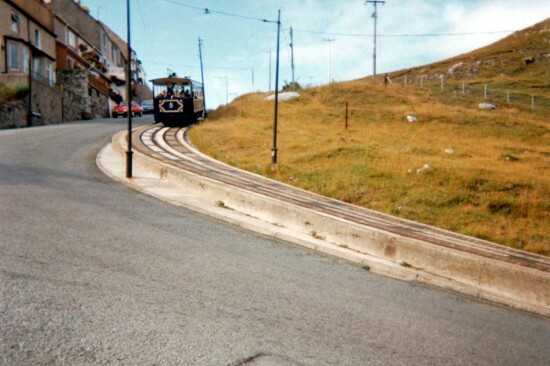 This entry was posted in Great Orme Tramway, Picture in Time. Bookmark the permalink.